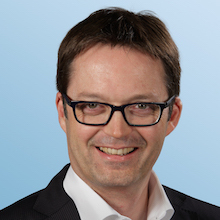 Bernd is Partner based in our Frankfurt office and leads Arthur D. Little’s global Operations Management practice. He also leads our global Industry 4.0 activities and is member of our Digital Transformation & Analytics think tank. His main areas of expertise cover strategy definition, operating model and organizational design, operational excellence, supply chain management, performance improvement, and transformation programs in a wide variety of industries. With his projects, Bernd helps our clients to anticipate future trends in operations. He designs innovative solutions and helps to transform businesses towards performance excellence across the value chain. For example, he has helped leading companies in automotive, transportation, energy and other industries to apply Industry 4.0 and digital technologies in operations to achieve quantum-leap efficiency gains, and as well as assisting them in generating value out of data. Applying digital technologies such as artificial intelligence, bots, collaborative robots, augmented reality, blockchain and additive manufacturing allows for EBIT improvement from 30% to 50%. Bernd has also helped various clients in transforming their supply chains and procurement from transaction-oriented units to value-generating functions, which delivers strategic impact for the companies’ competiveness. Bernd has published our viewpoints in operations such as the “Future of Operations in the Digital World”, “Procurement 4.0”, and “Radical Simplification”. He is responsible for our flagship operations benchmark in procurement, supply chain and manufacturing. Prior to joining Arthur D. Little, Bernd worked for 7 years in manufacturing companies in finance, controlling and supply chain management. Bernd is married, has two beautiful kids and enjoys family life in a fantastic and traditional wine region in Germany. Being a former enthusiastic handball player, Bernd experienced and believes in the success of team and fair play.